1.Place short ribs in a zip top plastic bag. 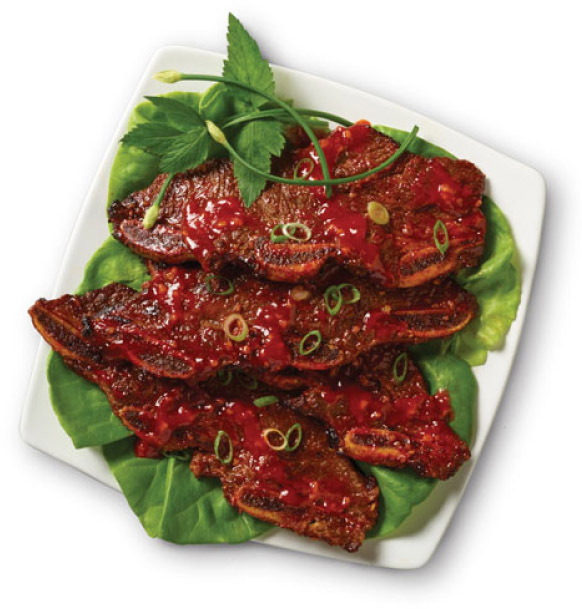 Combine 1/2 cup Culinary Tours Gochujang Sauce, vinegar and soy sauce in a small bowl; pour evenly over short ribs and seal bag. 2.Marinate in refrigerator 2 to 4 hours. 3.Place broiler pan or grill rack 4 inches from heat source; preheat broiler or grill. 4.Remove short ribs from marinade and place on broiler pan or grill. 5.Cook 4 minutes, turn and continue cooking 3 minutes, basting with remaining Culinary Tours Gochujang Sauce. 6.Serve sprinkled with green onions.